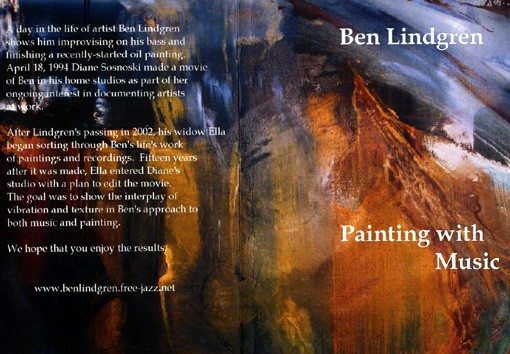 A day in the life of artist Ben Lindgren shows him improvising on his bass and finishing a recently-started oil painting. April 18, 1994 Diane Sosnoski made a movie of Ben in his home studios as part of her ongoing interest in documenting artists at work. After Lindgren’s passing in 2002, his widow Ella began sorting through Ben’s life’s work of paintings and recordings. Fifteen years after it was made, Ella entered Diane’s studio with a plan to edit the movie. The goal was to show the interplay of vibration and texture in Ben’s approach to both music and painting. We hope that you enjoy the results.